About YOU – make connections from a collage of reflections! That phrase “upon reflection” sounds so casual, so gentle, so optional in a way – as if you hadn’t really needed to do it, but you did, and by the way, it changed your mind … hmm …. So, what is the process of reflection – that one might use it to change one’s mind? What does it actually mean? Reflection put simply means examining WHY you believe what you believe – asking yourself questions about your reasons for your beliefs and considering the results with the possibility of forming new conclusions – beliefs. It turns out that this inquiry process that we call reflection is considered a KEY element to a good life – an integrated life – a life of wisdom – a life worth living – according to some highly respected teachers. Who said it first? Socrates. According to Plato’s works, Socrates embodied a practice of constant inquiry and believed that without such inquiry life was not worth living. A much later teacher, John Dewey, an educator and philosopher of the early 20th century, wrote a lot about how people think and he identified reflective thought as a system of “protracted inquiry”, while suspending judgment. He identified the ability to think this way as necessary for intelligent action related to ill-structured problems – all those problems we face for which no particular solution algorithm exists. The importance of preparing learners to address such ill-structured problems, related to complex world issues as well as personal life choices, is now a frequent topic in education at many levels, in many countries. And what is a key practice, encouraged by many respected educators, to help learners develop intelligent problem solving skills? Surprise – a practice of reflective inquiry! Many institutions, programs, and individuals are adopting processes that guide and stimulate reflective thought – responding to questions – particularly related to one’s learning experiences – both formal and informal. Evidence shows that learners can learn more deeply by responding to questions about their learning. They can learn more deeply about the topic under focus, by making more connections with the concepts, and they can learn more deeply about themselves, about how they learn, why they learn, and what matters to them. Such learning contributes to deeper integration of learning and to better, more integrated life choices, because the better one understands what one values and how to apply concepts in new contexts, the better prepared one is to make meaningful life choices related to all issues. Based on the advice from diverse sources – a reflective thinking practice involving systematic inquiry about our learning experiences and our resulting beliefs is a valuable tool for developing and leading a life worth living. 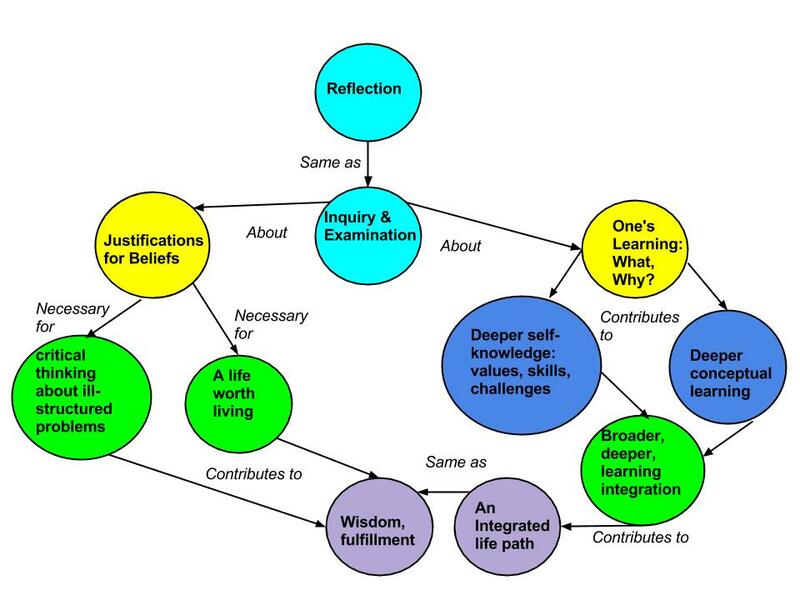 This entry was posted in Learning Portfolios, Reflection and tagged Education, Inquiry, John Dewey, Learning, Methods and Theories, Plato, reflection, Socrates on May 6, 2013 by skroeze.